PORK CHOP HILL is a detailed ASLComp variant that tells the story of the Korean War from the battlefield made famous by SLA Marshall and the eponymous Hollywood movie. The action is gripping, the Chicoms are coming... and still coming. Will they ever stop coming? You will decide, while you play it all out again on the enlarged-hex colour map with historical named leader counters. Two copies of a FREE bonus counter sheet of colour die-cut counters providing AFVs and MMCs and SMCs plus some bonus counters for owners of GENESIS II (296 counters in all). a 4-page Special Rules document. 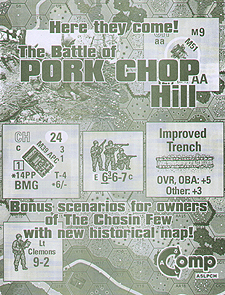 8 scenarios on 4 cards - 7 playable on the historical map provided in this product and one bonus scenario for owners of THE CHOSIN FEW. NOTE: this is not a complete Game! Ownership of The Chosin Few by CH, Beyond Valor and Gung Ho is required to use this product.